As expected, all the magazines have today is a summary of last week's news in Dengeki PlayStation with some short comments from YamamotoD. Shingen and Kenshin are settling things at last! As for what the two of them do next, since they're on the same wavelength there's material about them as warriors - and as friends. YamamotoD recommends choosing Shingen in his Hyottoko Kamen outfit, then setting his partner to Sasuke in the Tenko Kamen outfit. This time around, we'll see a different side to the usual hungry, generous, 'big brother' Toshiie. Directly opposing the Oda Army he used to belong to, Toshiie has to face up to his own past as well as to Shibata Katsuie, who has shut his feelings away. What happens after it's all over cannot be predicted. The hints are his Tenka Medal costume and the phrase 'Ahead of Sakamoto Ryouma' (haha). The biggest change for Matsu is her brand new Basara move. Naturally, with all of her animal friends involved it turns into slapstick comedy. That craziness is even present in her story. Whether Matsu is rushing about trying to arrange a marriage for her nephew Keiji or having a cooking battle right in front of the shogun, there's a Maeda-style sense of fun to the drama. Please play with a smile on your face. Sengoku Basara 4 Sumeragi has shot up to 7th place in Dengeki PlayStation's ranking of upcoming games, with 39.1% of its votes being for the PS3 version and 60.9% for the PS4. That's a pretty good ranking, especially since it's (temporarily) overtaken Final Fantasy XV and some other big-name RPGs. The game doesn't fare quite so well in Weekly Famitsu, where it's now ranked in 21st place for the PS3 version and in 33rd place for the PS4. 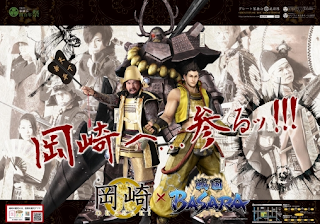 Sengoku Basara's Tokugawa Ieyasu is participating in another real-life collaboration in the Okazaki area, this time with the Great Ieyasu-kou 'Aoi' Bushoutai, a troupe of people who dress up as historical figures and try to encourage interest in visiting famous sites. I was lucky enough to see several members of the group when I visited Okazaki Castle; they're often wandering its grounds to meet tourists and chat about the area's history. If you time a visit well enough, you can even catch them participating in a mock battle or performing live music. Okazaki is famous for being the birthplace of the real Tokugawa Ieyasu, so the Sengoku Basara version been selected to appear on some promotional posters designed to encourage people to visit. He's accompanied by Tadakatsu and the Great Ieyasu-kou 'Aoi' Bushoutai version of Ieyasu. The campaign begins in July! There should be a lot of news next week, with another Weekly Famitsu feature likely and the official magazine being released, not to mention another new video on Friday morning. I'm gonna guess he fails to defeat Nobunaga and gets banished to Okinawa or something? Meh, probably not but that's all I got with such vague clues! Uh oh, sounds like Matsu is trying to hitch Keiji up with Maria. I wonder what Magoichi has to say about that (if anything). Shingen and Kenshin friendship yes please! @_@ As well as stone-punch ability haha. Obviously, he and Matsu are going on a much-needed vacation. There's no other way to get that tan. But seriously, if Toshi failed to beat Nobunaga, he'd probably be in hell. Hmm, there are several eligible ladies for Keiji if Matsu is trying to get him to settle down. I suspect she won't pick the one he wants the most, though. We know Kojuuro and Sasuke get one, but for the other eight, it's not too clear. I'd bet on them getting some. I strongly suspect that Kanbee and Gyoubu at least will be getting another route (they know Gyoubu is popular and Kanbee getting a route makes sense if they're adding a '3-bee' stage). However, the only confirmations we have so far are the two Mewshuji mentioned. Ouu who do you lot think will win outta shingen and kenshin. It sounds as though you'll get to see both outcomes soon enough. I wonder how each of them will take the other down?